We built a striking new web design to promote our client’s extensive range of services in high-end video production and photography. Ensuring your company has a creative web design is especially important when you’re working in a highly competitive market. 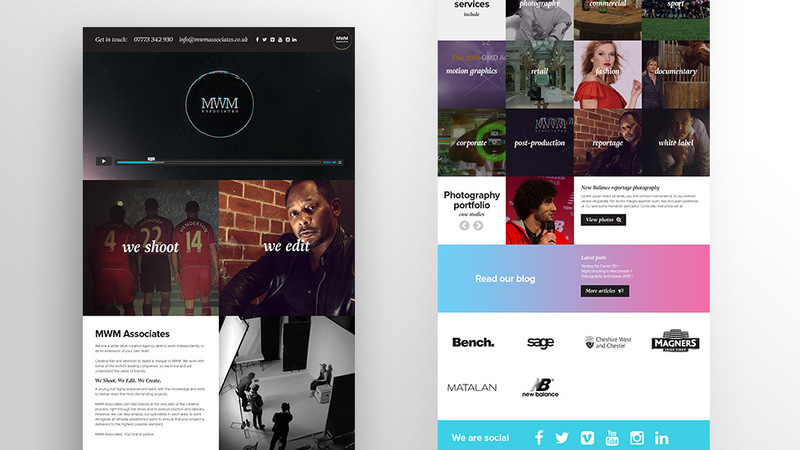 MWM Associates, a creative agency focused on high-end video production and photography, asked Parker Design to help it build an eye-catching new website to promote its extensive range of services. In addition to increasing brand awareness, a creative web design would draw attention to the company’s impressive showreel, project portfolio and behind-the-scenes blog. Our creative team upgraded the company logo by incorporating a stronger font to ensure legibility for web, print and social media reproduction. The palette was also expanded to include colours inspired by the ‘split-RGB’ filters used in the post-production process – a clever reference that would be picked up by industry insiders. Our digital team worked closely with MWM photographers and producers to develop a creative web design that would fit the company’s needs and increase its visibility. Centering the website’s look and feel around full-screen video and high-res images, we produced an energetic homepage with a large-format showreel – perfect for an audience that prefers Macs and stunning graphics. This feature served two purposes: to immediately capture the attention of website visitors and expose them to the quality and diversity of work that the company produced. Parker Design also recommended a minimalist design with strong, edgy colour scheme to prevent the site from becoming too busy or distracting viewers from the work. The creative website design was built to appeal to a variety of target audiences, including advertising and marketing agencies, as well as established brands needing experienced experts in film production and photography. MWM Associates was thrilled with its new website – which is more visually impactful than those of other competing agencies. The creative web design has also resulted in increased site traffic and exposed the company’s photography and video production services to a wider audience of potential clients.